A biweekly excuse for cool people in Lisbon to get together, socialize, have some drinks and doodle. So what exactly is drink & draw? 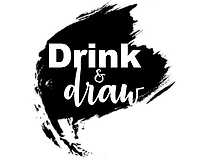 Drink & draw is a pop-up drawing session with a casual party atmosphere where you'll leave your cares behind and go home with a one-of-a-kind sketch created by you. Invite your friends, meet cool people, enjoy a few drinks and unleash your inner-artist. Sessions twice per month, in some of Lisbon's coolest venues. You shall socialize, draw, have drinks, network, and get plastered in the process. You shall arrive at each drawing session thirsty and ready to have a great time. Respect differences and be open to new concepts and ideas. Drink & Draw joined forces with some of our favorite hidden spots in Lisbon to offer you a fun, unique, and welcoming environment so you can feel inspired. Drink & Draw sessions are pure eco-friendly. That's why we're plastic free, use sustainable drawing materials, partner with eco-friendly spots and advise zero alcoholic waste! Drink & Draw sessions were designed to "disconnect to connect". So turn off your phone, be present and enjoy the moment. It's not about what's "perfect," it's about what's fun. That's what makes Drink & Draw meetups the best parties ever! Thank you. Your data has been submitted. It's wrap up in this spirit of independence and liberty that we return to the house that was once the stage of the most feminism session. A Sala - cafe and social club - located in the São Bento, was born out of the desire to create a place of socializing and sharing, inspired by the old social clubs and associations. Created by a group of friends mostly from the Algarve, with common interests in the arts, A Sala reflects these influences in its programming and in its menu where you find southern flavors to enjoy the any time of the day, to share or savor alone while reading or working. A warm cozy place that is already our extended living room too. Come join us at our next Drink&Draw session and let's celebrate 44 years of creativity' independence. Spots are limited. Advanced registration required. Spots are limited so sign up to snag yours today ! As soon as you reserve it you'll receive an email with all the details and when you send us the payment' proof you are IN! Everybody is welcome, no matter if you just picked up a pencil the first time in your life or if you're a professional artist. No skill level required, it's all about having fun. There's no need to bring any drawing materials (but feel free to bring your own), just a big, fat dose of enthusiasm. Your ticket includes: drawing materials (pencils and paper), good music, model and alcoholic beverages. have fun meeting new people and reconnecting with your inner artist - just make sure you agree with our RULES. Fun art. Not fine art. "Turns out, art and alcohol can be a good mix, so we built Drink & Draw to help people escape the stress-filled everyday and relax in our colorful, casual atmosphere." Lifeaholic and creative mind, Tânia is the passionate voice of the project. With a marketing background, she manages every single business or meet up with her friends the same way, so don't try to resist and expect to be caught up in her contagious bubbly personality. She loves people watching, making up new words, a perfect bang trim, Lisbon and a glass (or two!) of wine! Why Drink & Draw? I believe we all should do more things that make us put our phones down. Arts lover and an "habitué" of bold decisions, Ana is responsible for all our visual communication and everything you can see. Her aesthetic know-how (and smile) will make our Drink & Draw meetups and the world a little bit more beautiful and feminist. She loves healthy stuff, breakfast, discovering new places, to be in love, squats, and Tânia! Why Drink & Draw? I believe in Drink & Draw as Kanye believes in Kanye. © 2018 Drink & Draw.